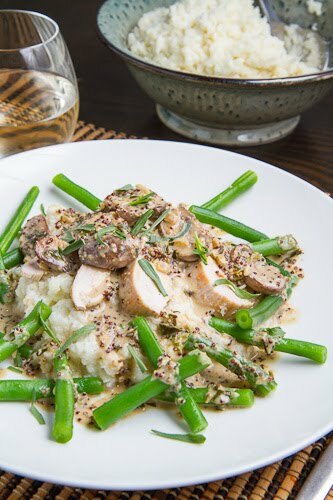 Chicken served in a quick, easy and tasty tarragon and mustard mushroom sauce. With grilling season over we are now forced to cook indoors but that does not really bother me so much as I have always enjoyed cooking meat in a pan over the stove where you can get a good sear and some caramelization. Of course when you caramelize meat in a pan you get those brown bits of flavour stuck to the bottom of the pan and they are just begging to be scraped off with a nice deglazing to reclaim all of the flavour. 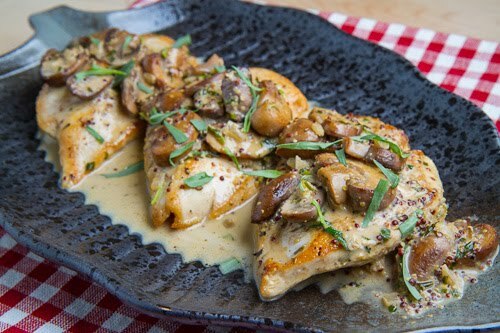 It is with this that I made these super tasty pan seared chicken breasts in a mushroom, tarragon and mustard pan sauce which is really easy to make and quick enough to do on a weeknight. The tangy mustard and anise-y tarragon are an amazing flavour combination in this creamy pan sauce and you really cannot go wrong throwing some mushrooms in to fill out the sauce! What are your favourite pan sauce recipes? 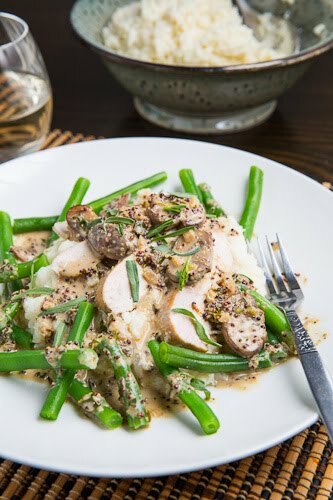 I served the pan seared chicken breasts in a mushroom, tarragon and mustard sauce over mashed cauliflower , which was perfect for soaking up all of the extra sauce, and with a side of simple steamed green beans. Heat the oil in a large pan over medium-high heat, season the chicken with salt and pepper, add it to the pan and cook until browned, about 2-3 minutes per side and set aside. Add the oil and mushrooms and saute until browned on both sides, about 7-8 minutes. Add the wine, deglaze the pan, add the chicken broth and cream, bring to a boil and let simmer until reduced by half, about 5-7 minutes. Mix in the mustard and tarragon, season with salt and pepper, return the chicken to the pan and cook for 2-3 minutes. wHER IN THE DO i FIND A SINGLE ICON (ARROW) TO CHCLICK ON TO PRINT THE RECIPE??? This looks so yummy I have to leave out the mushrooms though because my partner is allergic. A substitute suggestion please. Unfortunately tarragon is not a favorite herb either. Thyme maybe. Would sage be too strong. I have both regular thyme and lemon thyme still avalible in my garden. Port wine and cream sauce or a wattleseed or maybe even the sauce you've just made. This looks yum. Fortunately we live in a climate where we can grill year round, plus it's summer down here but sometimes pan frying just works. This recipe looks very delicious. My mouth went all watery just looking at the photos. I love the combination of chicken, cream and tarragon!! Fabulous! That looks wonderful, Kevin! Perfect recipe for the chilly weather we're getting now. Thanks! Anonymous: There is a link to the printable version just above the ingredients. Enjoy! Another beautiful dinner recipe! The Mushroom, Tarragon and Mustard Pan Sauce sounds fantastic! Funny, it didn't need any help at all to me. Perhaps the poster above me didn't spend time to let the ingredients develop flavour, and the sauce to reduce. It was delicious. I served along with roasted & slightly smashed red potatoes, and green beans. I sadly had to give away more than I expected to my children. This was our lunch on Sunday. I had also made rice/pilaf to accompany this delicious chicken dish. IMy only change was I added yogurt instead of heavy cream. It worked out wonderfully, thickened the sauce & enjoyed by the whole family. Will be making this wonderful dish at my next dinner party. Thanks for sharing.